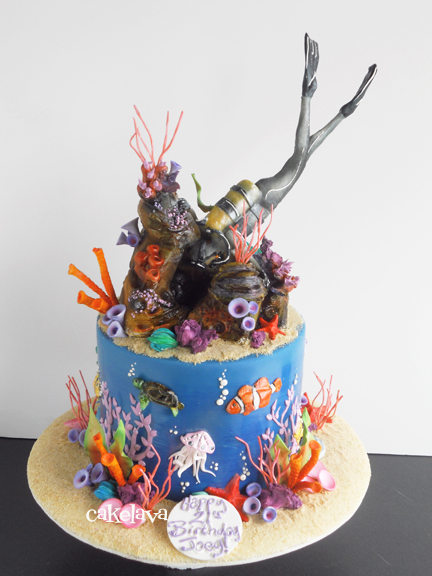 The colorful scuba diver looking into a cave birthday cake is one of our favorite recent projects! The week Rick made the cake was hectic because his other cakes were also artistically demanding, making the week as challenging as those that have more cakes with less complexity. The cake was made as a 21st birthday gift from his aunt to Joey, a Marine Biology major at the University who enjoys scuba diving. Rick started making the decorations for the cake early in the week, allowing extra time to sculpt the cave and scuba diver. Sculpting the cave was very difficult. It was important to make it look as realistic and organic looking as possible. Rick estimates it took him 4 to 5 hours to make just the cave and diver. A cake with this big a wow needs to be tasty on the inside and the client chose our "Broke da Mouth" flavor, a delicious mango cake with a mango curd and cream filling with Li Hing Mui. Li hing mui is a sweet and salty dried plum sold in the islands and a popular ingredient with local chefs. In Hawaii, "Broke da Mouth" is a pidgin English term that literally means the flavor is so good, it will break your mouth - an explosion of flavor! My mouth is practically breaking just thinking about our "Broke da Mouth" cake! I always have to smile when I see Rick making cakes with a coral scene. He has used some version of a coral scene on many under the sea cakes. We spent a good part of 2012 touring around the world with his "Discover Your Inner Artist" clownfish class, where he taught students how to make the realistic looking coral. The coral pieces have been incredibly versatile over the years, being used on both sculpted and non-sculpted ocean themed cakes. Although I have watched Rick and his students make hundreds of the colorful decorations, it never gets old and it always brings the already lifelike cakes to another level! 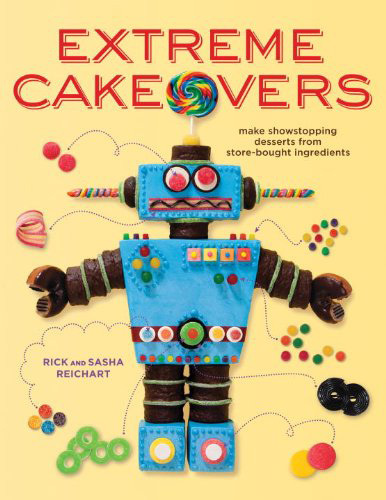 You've seen the cover of our book, EXTREME CAKEOVERS: Make Showstopping Desserts from Store-Bought Ingredients, which is being released on July 9, 2013 by Clarkson Potter (Random House). You may have read the synopsis and know that our book teaches anyone - regardless of having cake making or baking experience - how to transform everyday store-bought cakes into stunning showpieces using candies, cookies, and frosting. You don't even have to turn on the oven to make the cakes in the book (unless you want to)! Starting today, we are very excited to offer you an early peek at what's inside EXTREME CAKEOVERS at our brand new website, www.extremecakeovers.com. On extremecakeovers.com, we're revealing photos for the first time on the internet of some amazing finished cakes you'll learn to make! There are also details about the book, information on how to purchase it, and links to connect with us on social media. extremecakeovers.com, which was beautifully designed by Dana at The Wonder Forest, is still in its early stages because the book won't be in stores until Summer. We will add new information as we have it so feel free to check in regularly for updates! Rick and I have been working on EXTREME CAKEOVERS since 2011 and it has been an incredible journey that is indescribable! 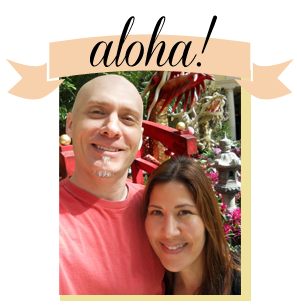 In those two years, we have juggled running cakelava in Hawaii, fulfilling cake orders, and traveling around the world for Rick's classes, all while working on parts of the book. We are so excited, we can barely contain ourselves and counting the days until the book's release! 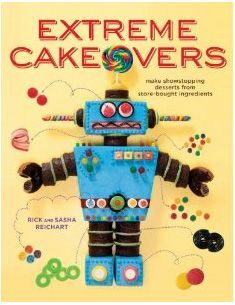 For those of you who can't wait to get your hands on EXTREME CAKEOVERS, it is now available for pre-order in paperback and e-book versions at Amazon.com, Barnes & Noble, Indiebound, your favorite bookstore, or directly through Random House. Thank you to everyone who has given us support as we've worked on EXTREME CAKEOVERS, the biggest cake project of our lives!